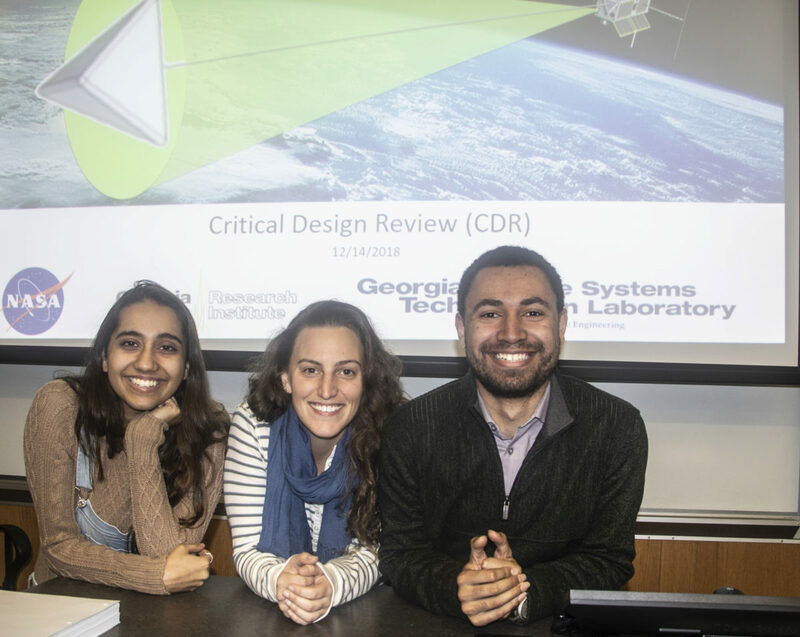 On Friday, December 14, while most students were recovering from finals or prepping for commencement, the 25 students working with Prof. Brian Gunter on the TARGIT cubesat were sweating through another high-stakes exam: a two-hour critical design review (CDR) of their spacecraft design conducted by officials from NASA. Prof. Brian Gunter was encouraged by the feedback he got from NASA reviewers during the CDR for the TARGIT cubesat on Dec. 14. If that gives him any free time, he'll likely use it follow RANGE, the cubesat his team launched Dec. 3. 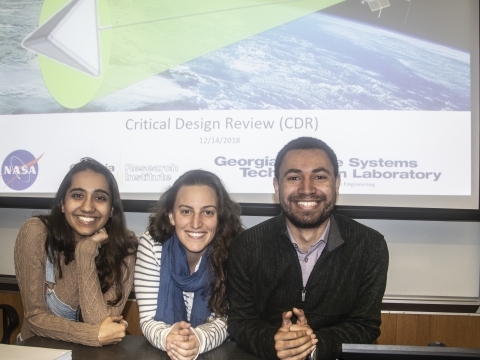 "The reviewers were genuinely impressed with what they heard, and commended the students on the quality and professionalism of the review," said Gunter, who, just last week, oversaw the launch of another cubesat, RANGE. "It looks like we're on to the next phase of this mission - ordering materials, testing electrical circuits, writing code, and... building this cubesat over the next several months. We could be ready to do 'day-in-the-life' testing in the fall, and, really, be ready to launch by Thanksgiving." 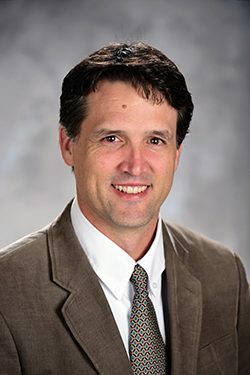 The Tethering And Ranging mission of the Georgia Institute of Technology (TARGIT) cubesat is one of 34 small satellites chosen by NASA in 2016 to participate in the Cubesat Launch Initiative (CSLI). That initiative guaranteed participating nanosatellites a spot as a secondary payload aboard an upcoming NASA-supported rocket. A separate $200,000 NASA Undergraduate Student Instrument Program (USIP) grant underwrote the cost of the mission's hardware. Once built, the solar-powered TARGIT cubesat will house a compact LIDAR altimetry system capable of delivering accurate topographic data (down to the centimeter) from as far away as 10 kilometers. The project has been subjected to other NASA reviews along the way, but none were as exacting as the CDR that took place Friday. "There were eight student teams who'd taken on critical parts of the mission development, and each team had to answer a lot of questions," said Gunter of the afternoon-long presentation. "They had to justify our design decisions, our component choices, and demonstrate that we knew how to construct it. They had to show them the tests we'd already run and the tests we'd run later on." Once TARGIT is launched into space, it will deploy a small inflatable on a tether and create a 3D image of the target using the miniaturized LiDAR imaging camera. Because the inflatable's size and reflectivity will already be well-known, this will give engineers a chance to test the camera’s accuracy. Eventually, the tether will be cut and the satellite will use its precise pointing and tracking capabilities to continue capturing images of the inflated target as it drifts farther and farther from the satellite. This final phase is intended to represent a flyby scenario in a traditional space mission, where the topography of a comet, asteroid, or specific surface location is the desired target. Students working on the LiDAR subteam were quick to point out the challenges that this presents for them as engineers. "The system we're working on - LiDAR - is routinely paired with radar so we know a little about how it's supposed to work," said AE undergrad Saumya Sharma. "One of the challenges to using it on this mission is that we are using commercial off-the-shelf [COTS] components, so we don't have the luxury of building them to suit the mission. We have to work with them to make them fit, and to make them work in the space environment, which is very different from Earth's." Sharma said she'll be spending a lot of time scaling down their LiDAR technology so that it will fit within the tiny architecture of the 5-kilogram cubesat they are building. Her teammate, ECE undergrad Caleb Alexander, briefly shivered at the scenario. "I mean it's crazy, because I also work on LiDAR technology at GTRI - it's used by the military on planes - but it's much bigger. Getting it down so that it will fit into this cubesat will be really crazy." "Of course not," he said with a smile. "This is going to be a great challenge." Their teammate, Lorin Achey said their predictions of future success are rooted in the work they've accomplished to this point. "We came into this project with no knowledge, no classes, that looked at LiDAR," said the computer science engineering undergrad. "And in a very short time, we've built a functional knowledge of the technology so that we can build this system... now, our objective is to raise the technology readiness level [TRL] for the silicon photomultipliers [SiPM] that are used for detection. We're actually going to be the first to use the SiPMs in space." Time to Build the Cubesat. Saumya Sharma, Lorin Achey, and Caleb Alexander have worked together on the team that is building the LiDAR technology for TARGIT. Seven other teams will drill down on different aspects of the cubesat mission to meet a tentative August 2019 deadline for its completion. Those teams are: Structures, Tethering, Target, Power, Onboard Computing, Communications, and Attitude Control.